More men and women in Annapolis are turning to laser skin resurfacing in Maryland as an effective facial rejuvenation technique that can produce long-lasting results along with smoother, younger looking skin. Laser skin resurfacing uses a focused carbon-dioxide (CO2) laser beam to remove surface imperfections and dramatically reduce lines caused by sun damage, aging or heredity. Laser skin resurfacing results in a tighter, smoother and more rejuvenated appearance. Those considering laser skin resurfacing may notice facial sun damage, wrinkles, uneven pigmentation and superficial scarring. Crow’s feet, smile lines and vertical “marionette” lines around the mouth may also be reduced through laser skin resurfacing. To find out how laser skin resurfacing can help you achieve the look you’re seeking, contact Plastic Surgery Specialists. This procedure is performed under local anesthesia with IV sedation in our ambulatory surgical center on an outpatient basis. Treatment time can range from a few minutes to several hours, depending on the amount of resurfacing needed. After cleansing the face, your doctor will move the state-of-the-art UltraPulse laser light over the area of skin requiring treatment. Depending on the depth of wrinkles, scars, sun damage, or discoloration, the laser may be moved over the area repeatedly. The laser penetrates and removes the outer skin layers necessary to uncover a fresh layer of skin underneath. Once a fresh layer is exposed, healing can begin to rebuild new skin that looks younger and smoother. Laser skin resurfacing may be performed in two or more sessions to penetrate deeper areas, but one procedure is typically enough. Following laser skin resurfacing, patients may experience mild swelling, redness, minimal bleeding and slight discomfort. This can be controlled with medications prescribed by your surgeon. Recovery time is typically ten to fourteen days. At that time cosmetics may be applied. Your surgeon will provide post-operative instructions on how to gently wash and care for your healing skin after receiving laser skin resurfacing. This facial rejuvenation technique will reveal a refreshed, more youthful-looking appearance that can last for several years. There will be a reduction of fine lines, scars, discoloration and other inconsistencies in the skin. This procedure can be performed alone or in conjunction with another facial cosmetic surgery at our locations around Baltimore. 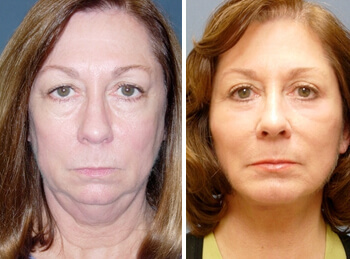 Eyelid surgery or face lift results can be enhanced with laser skin resurfacing. Facial skin rejuvenation in Maryland is a cosmetic procedure and is not covered by medical insurance. Each patient is responsible for payment of surgical and related costs.